Recently, NASA’s Magnetospheric Multiscale mission — MMS — was in just the right place at the right time to observe a new kind of turbulent particle jet in near-Earth space. The particle jet streamed from a particularly turbulent region called the magnetosheath, just outside the outer boundary of the Earth’s magnetic environment. It was the product of a magnetic reconnection event — an explosive process in which magnetic field lines cross and snap, flinging away nearby particles at high speeds. MMS is the peregrine falcon of spacecraft studying Earth’s magnetic field. Its instruments were designed to capture data at speeds a hundred times faster than previous missions. Most of the time, this allows MMS to study magnetic reconnection in great detail. The fast measurements, combined with MMS’s unique flying formation— four identical spacecraft flying in a pyramid — allows us to observe phenomena no one has seen before in 3D. But this reconnection event was special: the particles it sprayed out came so quickly, and in such small doses, that researchers had to invent a new method to be able to detect them. Here’s how it works. MMS detects particles using its Fast Plasma Investigation instrument, or FPI. Similar instruments on previous missions were designed to take advantage of the spacecraft’s spinning to gather measurements with one sensor as it swept a 360 degree view, much like a lighthouse beacon surveys the sea. FPI, however, uses eight spaced-out sensors to capture electrons and ions streaming in from all directions simultaneously, regardless of how fast the instrument is spinning. 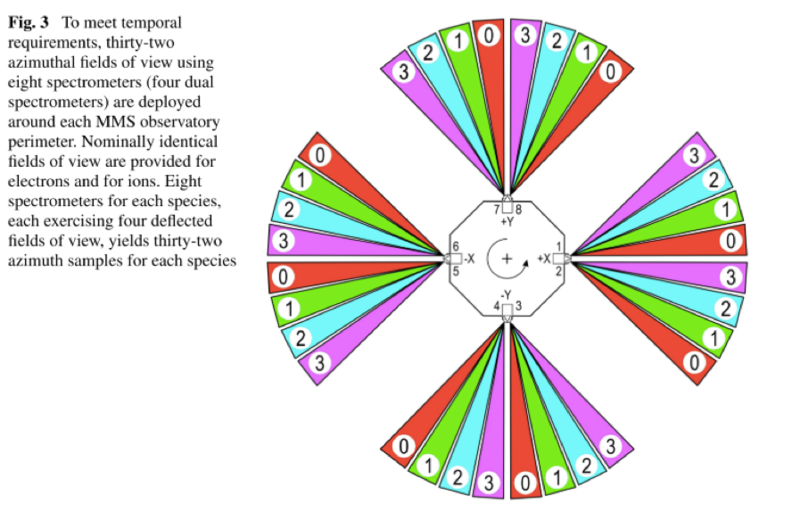 Each sensor has a “deflector” which allows it to sample particles coming from four different directions (labeled 0 through 3 in the figure below). This allows it to take much faster measurements of the full sky, completing a cycle through each of the deflector angles every 30 milliseconds. 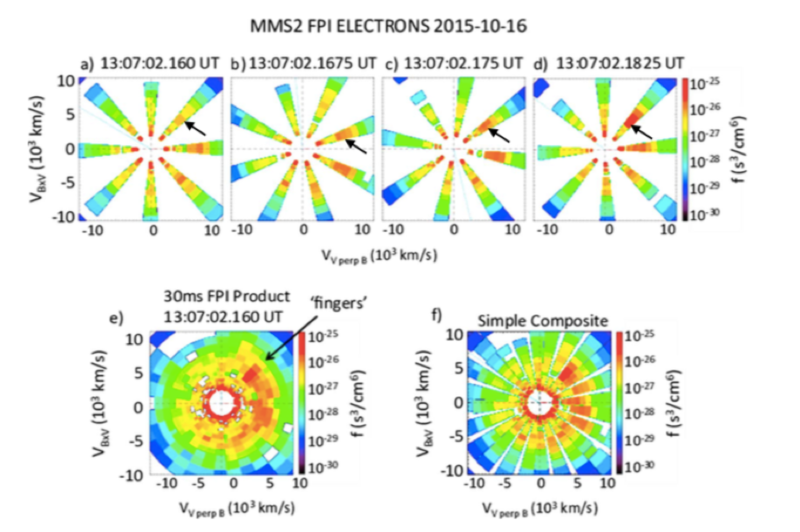 But for the recent particle jet, FPI’s cutting-edge speed is still too slow; It lasted just 45 milliseconds so MMS could only gather one data point during the entire event. They needed more data. So Amy Rager, a graduate student at NASA’s Goddard Space Flight Center in Greenbelt, Maryland, and her MMS colleagues came up with a new technique to help them analyze this briefer-than-brief event. Rager’s idea was to look at one deflector angle at a time instead of pooling them together. For each angle Rager separately interpolated the data — essentially reading between the lines and connecting the dots to gather extra data points. This allowed for measurements just 7.5 milliseconds long! The resolution of the data was reduced, since they were only looking at a fourth of the data as before, but it allowed the scientists to understand what was going on in these fleeting, action-packed moments. With the new method, the MMS scientists are hopeful they can comb back through existing datasets to find more of these events, and potentially other unexpected discoveries as well. The method may also help scientists and engineers develop faster instruments with more deflector angles in the future. On Sept 9-10, NASA’s Solar Dynamics Observatory witnessed a double lunar transit, when the Moon passed between the SDO spacecraft and the Sun twice in just a few hours. But did you know that the Earth can also get in the way? Here’s how Earth and Lunar transits work — and why they look surprisingly different. Due to SDO’s inclined circular orbit 23,000 miles above Earth, the Moon passes between SDO and the Sun between 2 and 5 times each year. While these transits block conventional observations of the Sun, we use them to understand the cameras in our instruments. One of these transits will someday block out an active region during a flare so that we can study the energy in that region with our instruments. There are two periods during the year when the SDO spacecraft repeatedly has its view of the Sun either partially or fully blocked by Earth. Eclipse seasons last about three weeks, and each eclipse takes about an hour or so from beginning to end. 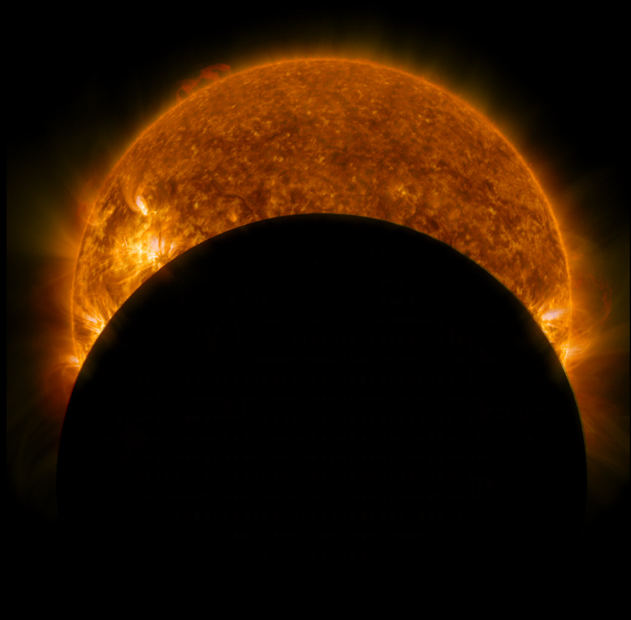 SDO’s 48-hour movies use a cadence of one image every 15 minutes. So, when these eclipses occur, the few black frames appear for about a second or less, just a short blip. Interestingly, when the Moon begins to block the Sun, the Moon’s edge appears very sharp. However, when Earth blocks part of the Sun, the edge is clearly uneven. This is because the upper parts of Earth’s atmosphere provide inconsistent absorption of the Sun’s light, whereas the Moon has no atmosphere, so we just see the crisp horizon of the Moon. You can see the difference in the images below. The fall 2018 eclipse season ran from August 12 through September 4. Aside from the double transit September 9–10, there will be one more on November 7. NASA’s STEREO spacecraft watches the Sun 24/7 — but the Sun it sees is not the one you and I see. 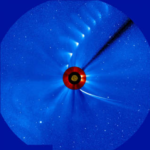 STEREO can see the Sun’s corona, or outer atmosphere. The only time we can see the corona from Earth with the naked eye is during a total solar eclipse, when the Moon blocks the much brighter photosphere below it. The corona is a pretty peculiar place — following laws of physics unlike the ones we experience in our day-to-day lives. Somehow, it’s hundreds of times hotter than the Sun’s surface, and scientists don’t know why (this mystery is known as the coronal heating problem). It’s also a minefield of gigantic explosions, like solar flares and coronal mass ejections. These magnetically driven eruptions explode with the energy of a million hydrogen bombs, hurtling hot, electrically charged particles every which way — including towards Earth. Yet for most of human history, we had to wait around for an eclipse to see it. Then in 1939, Bernard Lyot designed the coronagraph, a tool that created an artificial eclipse inside a telescope. Suddenly, the corona was open for viewing any time. 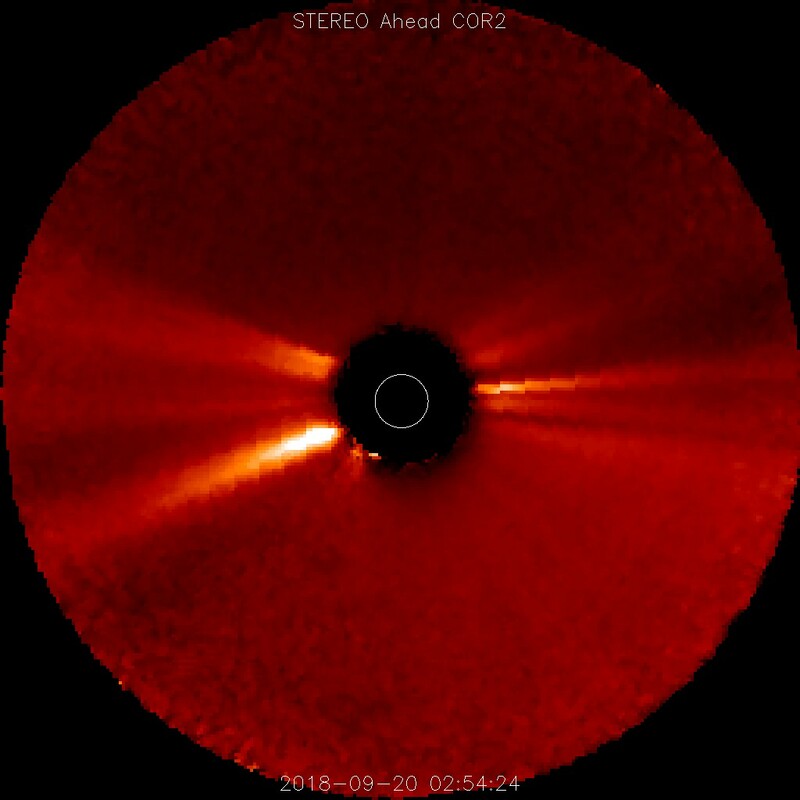 STEREO uses that technology to look at the corona to this day: for example, here’s an image taken by STEREO’s COR2 coronagraph yesterday. Here’s all you need to know about how coronagraphs work, and what they can tell us about the Sun’s atmosphere. Coronagraphs block out bright light from the Sun to reveal the dimmer areas right around it, including the corona, background stars and even passing comets. They do this in two steps. First, an occulting disk at the center of the coronagraph blocks out the photosphere. This gets rid of most of the Sun’s light, but not all — some light gets around it. So that light passes through another special part called a Lyot Stop, named after its inventor, which blocks out even more light towards the edges. That light is then refocused and after a few more corrections, we get an image where almost 99 percent of the Sun’s light has been removed. The black circle in the middle of the image is the occulting disk, which acts like a fake Moon to block out the Sun’s photosphere. In the video above, it has a superimposed image of the Sun from another STEREO instrument, the Extreme UltraViolet Imager-A, on top of it. There are two STEREO spacecraft, and each one has two coronagraphs with occulting disks of different sizes: COR1 shows a part of the corona closer to the surface, from about 1.5 solar radii out to 4 solar radii, whereas COR2 shows the corona out to 15 solar radii. One solar radius is about 432,300 miles. It’s not really all blue out there. STEREO’S coronagraph images are taken in grayscale; false color is added afterwards to help researchers quickly tell which telescope the image is from and to make some features more visually apparent. 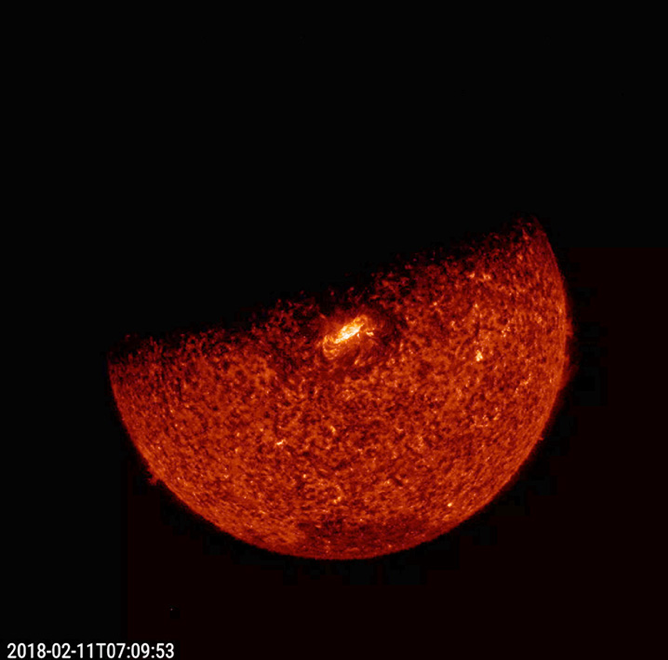 In some coronagraph images, like this one from ESA/NASA’s Solar and Heliospheric Observatory, or SOHO, you can see a dark streak across the image. That’s the shadow of the occulting disk pylon, which holds the occulting disk in place. In other coronagraphs, like STEREO’s COR1, there is no occulting disk pylon — the occulting disk is attached directly to the lens. In yet others like STEREO’S COR2, shown above, the occulting disk pylon is there, but so out of focus that you can’t see it. Faint ripples around the edge of the occulting disk result from diffracted light. When light enters the telescope, it hits the edge of the metal disk and bends, or diffracts, around the disk. The bright, elongated streams of light jetting out from the disk are called coronal streamers, also known as helmet streamers for their resemblance to a knight’s pointy helmet. Streamers are loops of magnetic field lines that trap electrons within them, which create their bright appearance. The solar wind pushes against coronal streamers, stretching them out to pointy tips, where puffs of plasma can escape to form the solar wind. The occasional puffs of material are coronal mass ejections, or CMEs — explosions of solar material being strewn from the Sun. The fastest CMEs can travel over two million miles per hour. If a CME is directed at a spacecraft, a flurry of what looks like snow floods the image, like in the video shown above. These are high-energy particles flung out ahead of the CME at near-light speeds, striking the camera. The immediacy and intensity of this “snowstorm” reflects just how fast and strong the eruption is: Less than an hour after the start of the eruption shown in the video above, accelerated particles traversed approximately 93 million miles from the Sun to STEREO. With the Sun’s bright light turned to low, you can see much dimmer background stars and comets. At the time of this writing, the STEREO mission has discovered 104 comets and viewed over 150. Now you’re ready to view the very latest coronagraph images from SOHO and STEREO (scroll down). Keep watch!